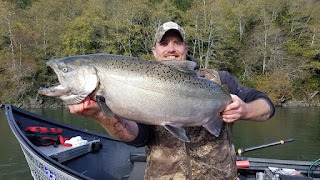 Chetco River Fishing Guide The fall salmon season on the coast this year was late to get started and ended as soon as it got going. The Chetco River Fishing was way behind schedule this year and didn't get started till after Thanksgiving when the first big rain storms filled the river with some fresh water. Mario Gomez of Ironhead Guide Service was on the scene when the river came into shape and got a few days in before thing got to low and clear. It seemed like the fish made their way into the chetco river in between storms and spawned before anyone new what was going on. The Smith river fishing was much of the same and no one really knows what happened to the salmon. We seen a few days of fish-able water but the numbers of salmon was not there and the only explanation is the fish got through in low water and did their thing. The smith river hosts some of the largest salmon caught every year and is a beautiful river to fish. Klamath River Fishing The salmon season on the Klamath River in 2018 was truly amazing. 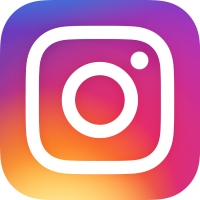 Ironhead Guide Service is the premier Klamath River Outfitter and they are front and center in some of the best fishing in the country. Klamath River fishing for salmon is some of the best angling you will find in the lower 48. Pro guide Mario Gomez of Ironhead Guide Service is one of the top rated fishing guides in the industry and he will ensure you angling success. 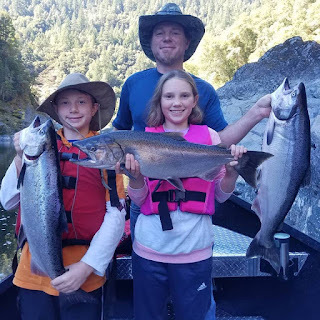 Take a look at these klamath river salmon and happy customers and you will see why IGS is one of the most sought after fishing guide services to operate in norther California and southern Oregon.